Religious actors rarely if ever determine democratization outcomes. However, they may in various ways and with a range of outcomes be of significance for democratization. The contributions are divided into two sections: (1) Religion, democratization and democracy, and (2) Secularization, democratization and democracy. Overall, they examine the three assertions in the bullet points above. The book’s starting point is that in general around the world, religions have left their assigned place in the private sphere. This means they have in many cases become recognisably politically active in various ways and with assorted outcomes. This re-emergence from political marginality dates back until at least the 1980s. At that time, the US sociologist, Jose Casanova noted that ‘what was new and became "news" … was the widespread and simultaneous refusal of religions to be restricted to the private sphere’. 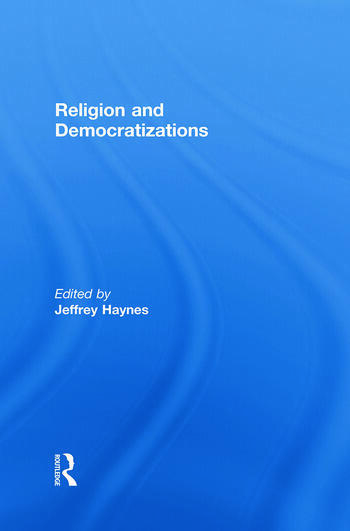 This involved a remodelling and re-assumption of public roles by religion, which theories of secularisation had long condemned to social and political marginalisation. Jeffrey Haynes is Associate Head of Department with responsibility for Research and Postgraduate Studies, Department of Law, Governance and International Relations, London Metropolitan University.